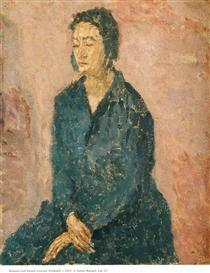 Gwendolen Mary John (22 June 1876 – 18 September 1939) was a Welsh artist who worked in France for most of her career. 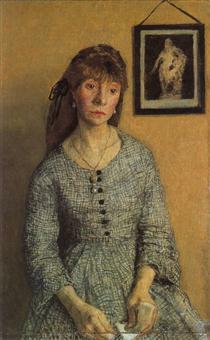 Her paintings, mainly portraits of anonymous female sitters, are rendered in a range of closely related tones. 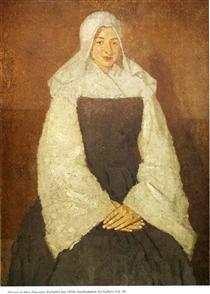 Although she was overshadowed during her lifetime by her brother Augustus John, her reputation has grown steadily since her death. 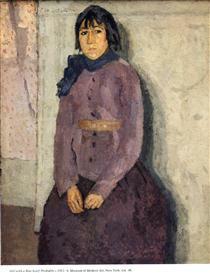 Gwen John was born in Haverfordwest, Wales, the second of four children of Edwin William John and his wife Augusta (née Smith). 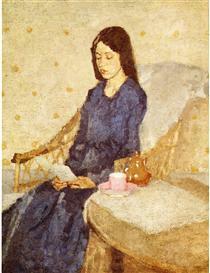 Gwen's elder brother was Thornton John; her younger siblings were Augustus and Winifred. Edwin John was a solicitor whose dour temperament cast a chill over his family, and Augusta was often absent from the children owing to ill health, leaving her two sisters—stern Salvationists—to take her place in the household. 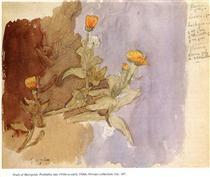 Augusta was an amateur watercolourist, and both parents encouraged the children's interest in literature and art. 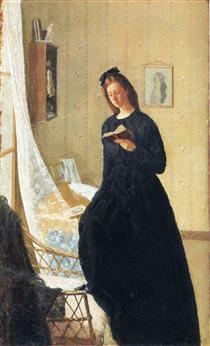 Her mother died when she was eight years of age. Regarding her mother's death and the loss of her influence, her brother, Augustus, later wrote: "My mother would no doubt have been helpful, but she died when I was a small child, after, I fear, a very tearful existence." Following the mother’s premature death in 1884, the family moved to Tenby in Pembrokeshire, Wales, where the early education of Gwen and her sister Winifred was provided by governesses. 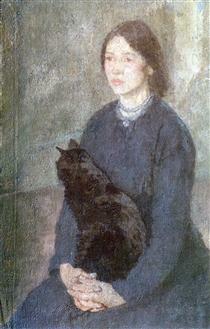 Aside from her sister, she also had two brothers, Thornton and Augustus. 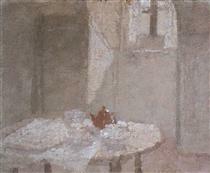 The siblings often went to the coast of Tenby to sketch. John said that she would make "rapid drawings of beached gulls, shells and fish on stray pieces of paper, or sometimes in the frontispiece of the book she was reading." 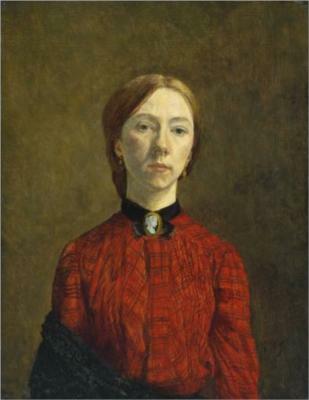 Although she painted and drew from an early age, Gwen John's earliest surviving work dates from her nineteenth year. 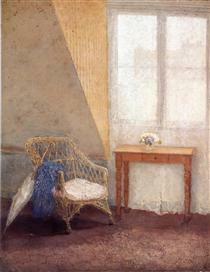 From 1895 to 1898, she studied at the Slade School of Art, where the program was modeled after French atelier's methods. 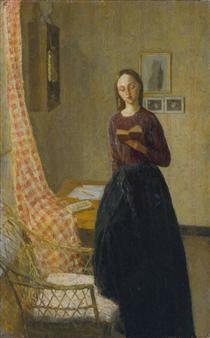 It was the only art school in the United Kingdom that allowed female students, although there was generally no mixing of men and women on the grounds, in classes, or in corridors. 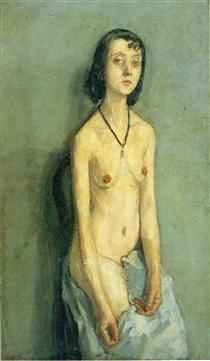 Like her younger brother, Augustus, who had begun his studies there in 1894, she studied figure drawing under Henry Tonks. During this period, she and Augustus shared living quarters, and further reduced their expenses by subsisting on a diet of nuts and fruit. 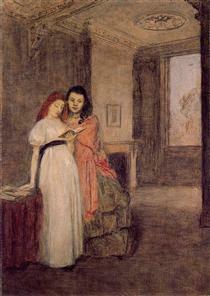 She developed a close relationship with the woman who would become her brother's wife, Ida Nettleship. 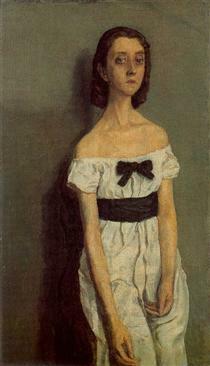 At this time, she also had a relationship with another of her brother's set, Arthur Ambrose McEvoy, which turned out unhappy. Good friends also included Ursula Tyrwhitt and Gwen Salmond. 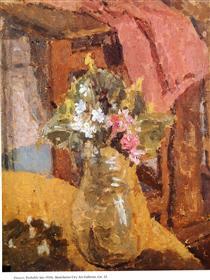 Gwen John won the Melvill Nettleship Prize for Figure Composition in her final year at Slade. 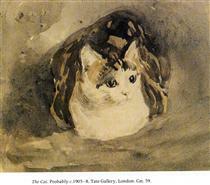 Slade students were encouraged to copy the works of old masters in London museums. 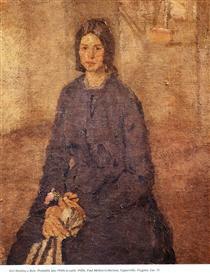 Gwen John's early paintings such as Portrait of Mrs. Atkinson, Young Woman with a Violin, and Interior with Figures are intimist works painted in a traditional style characterised by subdued colour and transparent glazes. 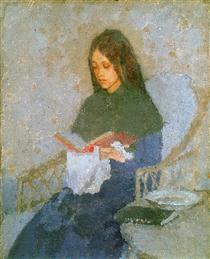 The Precious Book Gwen John ? 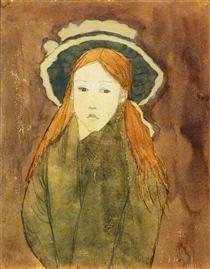 Little girl wearing large hat Gwen John ? 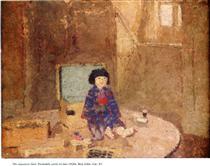 The Japanese Doll Gwen John ?